Kota Bharu (Jawi: كوت بهارو; occasionally referred to as Kota Baharu) is a city in Malaysia that serves as the state capital and royal seat of Kelantan. It is also the name of the territory (jajahan) in which Kota Bharu City is situated. The name means 'new city' or 'new castle/fort' in Malay. 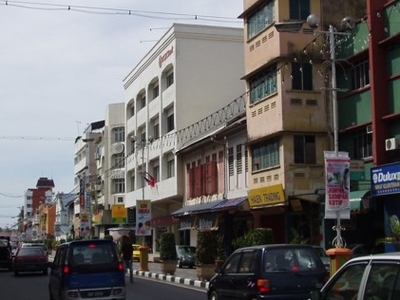 Kota Bharu is situated in the northeastern part of Peninsular Malaysia, and lies near the mouth of the Kelantan River. 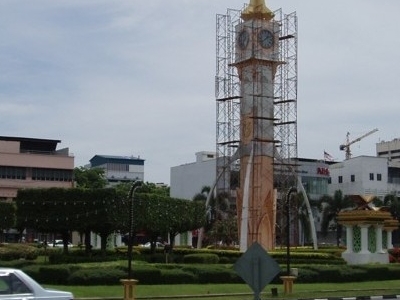 The northeastern Malaysian city is close to the Thai border. Kota Bharu is home to many mosques, various museums, the unique architecture of the old royal palaces (still occupied by the sultan and sultanah and off-limits to visitors but viewable from outside) and former royal buildings (which can be visited) in the center of town. The City is served by Keretapi Tanah Melayu's East Coast Line at the nearby Wakaf Bharu Terminal Station, in the town of Wakaf Bharu across the Kelantan River to Stesen Railway Station and Sultan Ismail Petra Airport, located in Pengkalan Chepa. The most famous shopping destination in Kota Bharu is Pasar Siti Khadijah (Kota Bharu Central Market). Most of its sellers are women. Next to Central Market is the nearly completed construction of Kota Bharu Trade Center (KBTC), which is considered to be one of the largest malls in Kota Bharu. The KBTC opened in August 2009, with Parkson as the anchor tenant for the mall. The Pasar Siti Khadijah and KBTC are connected by an overpass on the second floor. 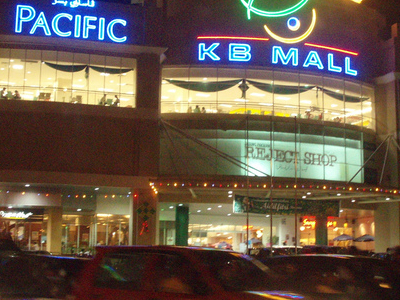 Other shopping centres in Kota Bharu are the KB Mall, Pelangi Mall, Kota Seri Mutiara, Pantai Timur, The Store and the new Nirwana Maju (at Bandar Baru Kubang Kerian). A new Tesco hypermarket opened in 2008. At present, most of Kota Bharu's downtown shopping area is undergoing a major reconstruction in whichseveral multi-story shopping centres are in their early construction phases. In March 2010, the Mydin Mall at Bandar Baru Kubang Kerian opened. Strong surf threatens all major beaches in the vicinity of Kota Bharu with substantial erosion. The community has been implementing wave breakers by means of piling up massive amounts of boulders in an effort to protect the coastline. Regular beach activity has become impossible as visitors frequent beaches further south. In terms of tourism, the most famous beach in Kota Bharu is Pantai Cahaya Bulan. Diving in Kota Bharu is a relatively new activity. At present, only one dive shop operates in the area. Trips out to the wreck of the IJN Awazisan Maru (known locally as the "Japanese Invasion Wreck") are among the sites offered. This Japanese transport ship was the very first vessel to sink in The Pacific War. The wreck is a 30 minute boat journey from a jetty which is 10 minutes outside of Kota Bharu. Here's the our members favorite photos of "Cities in Kelantan". Upload your photo of Kota Bharu!